INDIANAPOLIS, IND. (December 6, 2017) — Klipsch®, a tech-driven audio company and wholly-owned subsidiary of VOXX International Corporation (NADAQ: VOXX), today announces the debut of its next generation flagship Reference™ speakers — the RF-7 III floorstanding speaker and the RC-64 III center channel. The premium speakers are enhanced versions of the company’s acclaimed Reference II series, delivering hours of unrivaled high performance listening pleasure. The Klipsch Reference RF-7 III and RC-64 III speakers are infused with the latest technological audio advancements for ultra-sensitive, hard-hitting, accurate sound. The company was meticulous in selecting an ideal tweeter for the speakers before landing on the new 1¾” titanium compression driver with an enhanced phase plug geometry design that improves sound pressure linearity at high frequencies. A new Tractrix® horn further improves high-frequency response and extension, while enhancing imaging and dynamics. Proprietary Cerametallic™ woofers minimize distortion, and when paired with the Tractrix horn, provides ultra-high sensitivity and the highest efficiency in its class. The modern design enhancements and upgraded materials used to build the Reference RF-7 III and RC-64 III speakers reinforce their solid performance. Both speakers feature heavy-duty cast aluminum frame woofers that eliminate resonance. Cabinets are made from furniture-grade wood veneers and come in black ash, cherry or walnut. Magnetic grilles complement the premium design experience. The Reference RF-7 III floorstanding speaker is equipped with a unique dual chambered enclosure design that allows two 10” drivers and ports to work independently of each other. This improves linearity, minimizes anomalies in the critical midrange frequencies; generating a very articulate soundstage. The speaker’s slanted riser base enhances the appearance of the speaker, while providing a slight upward angle to direct sound to the listener. The Reference RC-64 III center channel features four 6.5” woofers, while the sophisticated design of the 2 ½ way network crossover maintains wide and even sound distribution. listener hears the center channel information exactly as intended. The Klipsch Reference RF-7 III (US MSRP $1,799 ea.) and RC-64 III (US MSRP $1,499 ea.) speakers are now at select retailers and at Klipsch.com. 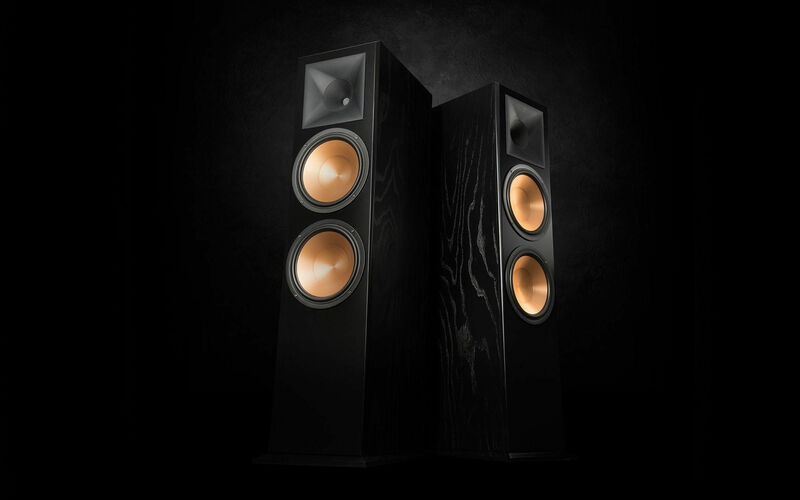 For more on the Klipsch brand and these speakers, visit Klipsch.com. In 1946 Paul W. Klipsch, inventor, acoustics pioneer and maverick, founded Klipsch Audio with the sole purpose of bringing the power, detail and emotion of the live music experience into his living room. Through the use of highly efficient speaker designs, handcrafted cabinetry and a thirst for real engineering breakthroughs – Klipsch, the great American loudspeaker company, was born in Hope, AR. Today, our diverse range of quality audio products includes speakers and headphones for almost any consumer and professional application – including cinema, whole-house, wireless, home theater and portable offerings. Honoring our founder’s legacy, Klipsch continues to be the legendary high-performance brand of choice for audiophiles and aficionados around the world. We are the Keepers of the Sound®. Klipsch Group, Inc. is a wholly-owned subsidiary of VOXX International Company (NASDAQ: VOXX). Klipsch is a trademark of Klipsch Group, Inc., registered in the U.S. and other countries. Tractrix is a trademark of Klipsch Group, Inc.